I've always been interested in the music and film musicals of these times, I just adore Fred Astaire and Gene Kelly can watch them for hours, and oh those women that looked and behaved like delicate creatures dressing in such wonderful flowing clothes. One problem though........ the dress sizes of the women in those times !!! 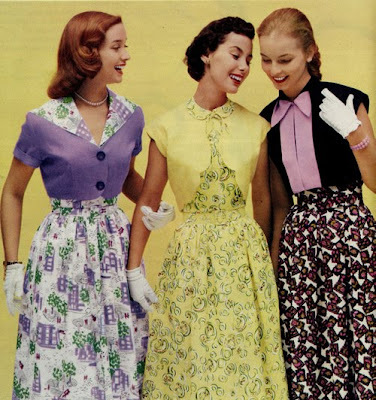 my what small busts and tiny waists... am having a problem trying to find patterns in my size 18 - 20, luckily some of the sewing pattern companies produce repro vintage patterns and sometimes go up to size 24 and . I'm also trying to do more arts and crafts from these times to.... so when I say MANY YEARS AGO I will mean MANY YEARS AGO !!! This afternoon I went to see my favourite swinging band THE GOOD FELLAS at the opening of the American Graffiti Fast Food in Forlimpopoli FC. Greyt music, greyt people, vintage cars and the guys'n'gals in their vintage clothing dancing boogie woogie just FAB . If they ever happen to be in your area go and see them you won't be sorry. Wish I were younger and had the figure asI would love to have the courage to dress up in pencil skirts, sheath dresses ecc,... the patterns I'm trying to find are more adaptable to my age and size !! !....mind you I am learning boogie woogie and lindy hop (swing) and am enjoying every minute of it even if it does leave me out of puff!!! One greyt retro blog came across is TALES OF A RETRO MODERN HOUSEWIFE, she has some greyt sections , my favourite is A PICTURE AND A QUOTE section. She would love to hear from other Italian bloggers as she would love some advice on Italian cooking. I'm learning a lot from these retro blogs and the philosophy of the family and the housewife in those times, I think we should all try and adopt at least one of the things every now and then. My favourite reading has been about how families lived on rations during WWII, especially in the UK, how woman dyed their legs with tea and drew a line up the back of their legs to resemble silk stockings when they would go out.how they took over from the men in the factories ecc ecc, would love to do some research and find out what happened here in Italy in those times. ah well time to come back to the real world and go and wash the dishes !!! !